Unlike with traditional Lightroom Web Engines, our Web Site Publishing Pro series of plugins use Lightroom 3's Publish Services to provide a significantly improved publishing experience. 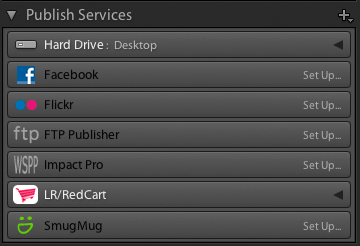 The Publish Services are listed at the bottom of the left hand set of panels in the library module. You can exported your site directly to your web host (check with them as to where your files should be exported), or else export to your harddrive. You should also choose the template file that you created when you designed your site. 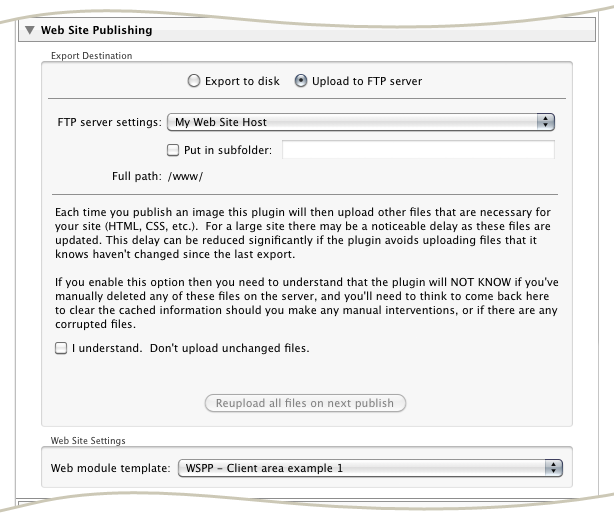 Note that you can revisit these settings at any time by right-clicking on the publish service and choosing "Edit Publish Service...". Once you create the publish service you'll see that you have a new collection called "Gallery 1" — this is your first gallery. Gallery: This is the name of the gallery as it's displayed in the Publish Services — this name isn't used on the published site unless you leave some of the following fields blank. Gallery type: Along with the "portfolio" gallery view (which is determined by the choice of WSPP you're using), WSPP plugins offer contact sheet views too. 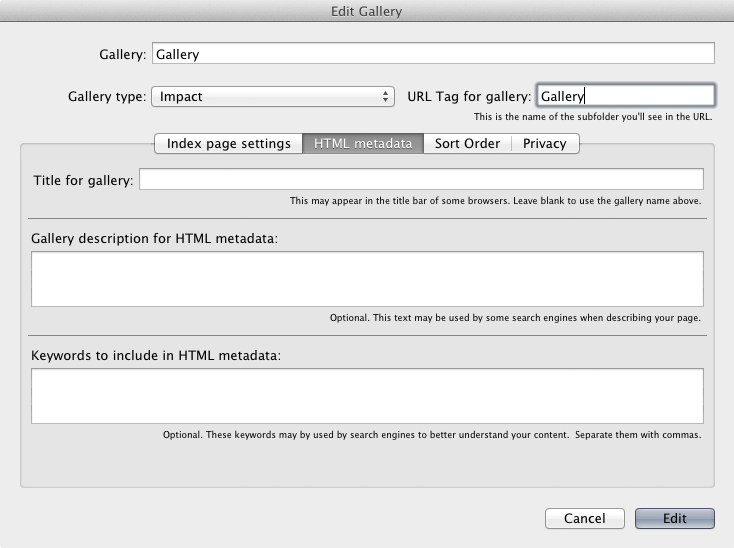 You can configure the type of gallery view that you wish to use here. URL Tag: This is the name of the sub folder will hold this gallery. For example, using the default settings displayed above, if the site is located at http://www.greatphotography.com/ then this gallery would be located at http://www.greatphotography.com/Gallery_1/. It's best not to change this once you've published your gallery since some of your visitors may have bookmarked their favourite galleries. 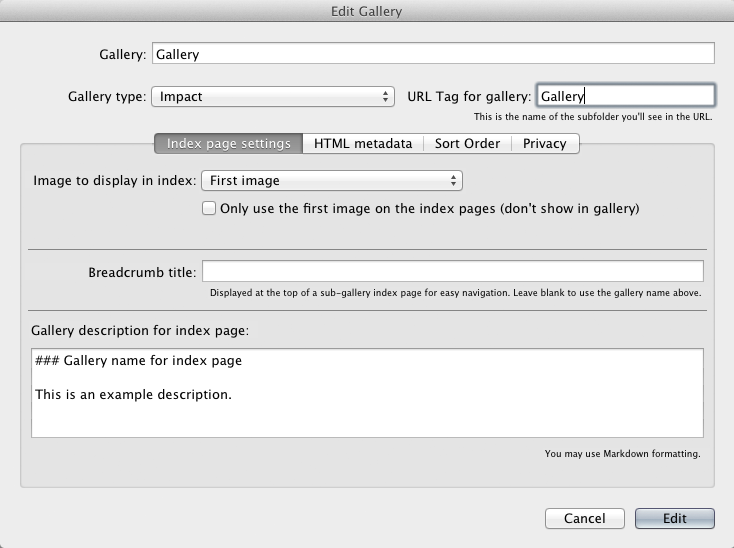 Image to display in index: Here you can decide how the plugin will choose the image from the collection that will be used to represent the gallery on the index page. For gallery sets the image will be selected from all of the photos beneath it. 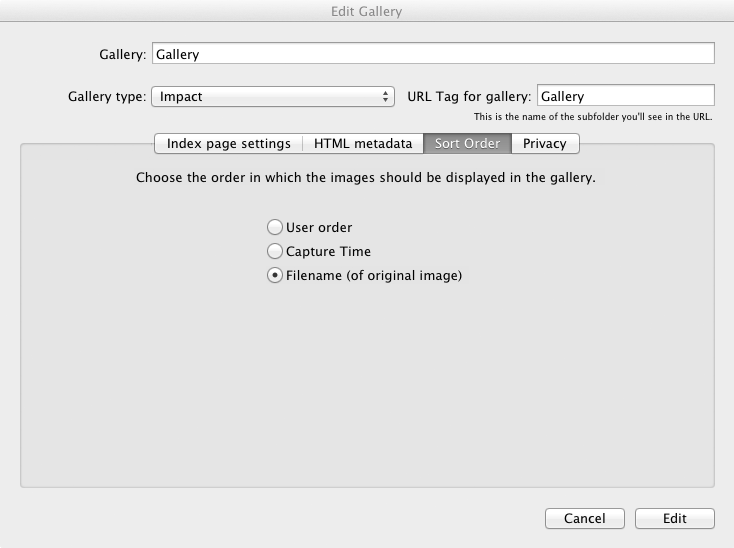 Only use... : This option, available with some image choice options in the menu above, allows you to specify that the image used on the gallery index page shouldn't be displayed in the gallery itself. This may be very useful if you wish to create a cropped virtual copy of an image for the index page. For example, in the Svarteld demonstration, the gallery index thumbnails are square cropped virtual copies of the images that are found in the gallery itself. Breadcrumb title: For sub-galleries this will be the title that's shown in the "Breadcrumb" navigation bar at the top of the Gallery Index page. Gallery description of the index page: This is the description that will be shown on the index page. Note that you may once again use Markdown to format the text. If you wish to include a title for the gallery then you should put this into the descriptive text — the default description does this by way of an example. These options define information that tucked away into the metadata of your pages. It won't be visible on the site, but it will be available to search engines and it's therefore very important that you fill it in. Title for gallery: Most web browsers will show the title of the web page in the window's header bar — this is where you can choose that title. It'll also be used by search engines when displaying search results. Gallery description: Search engines such as Google may use this description to describe your site in search results. Keywords: Search engines may use these keywords to better understand what your site's about. 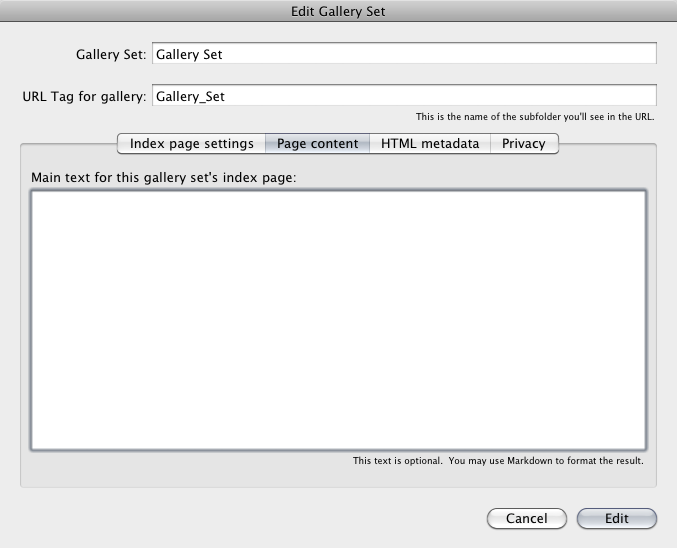 Note that whereas the "Index page settings" are concerned with how a gallery or set is represented on the index page in which it's displayed, this text will be displayed on the index page of the actual set concerned. Note also that the text for the top level gallery index (for which there is no associated collection set) is defined in the template that you create in the web module. Note how we've prefixed the galleries and sets with a letter — the order of the galleries on the Gallery Index page of your web site will be dictated by the alphabetical order of the gallery names in the publish service. 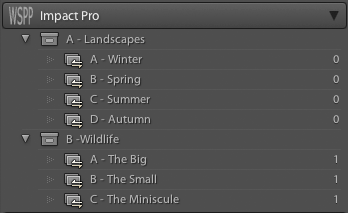 By giving each gallery a prefix we can control this ordering. The user won't see this because the gallery names here aren't used on the site itself (unless you've left fields blank in the gallery's settings). Publishing your site is the easy bit. Just add some images to your galleries, select them and press the "Publish" button. You can select several galleries or sets in one go by holding down <cmd> on the Mac or <ctrl> on Windows and clicking on each gallery. In this way you can create the entire web site with just one click on the publish button! 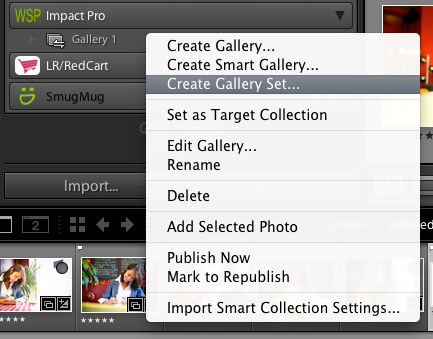 If you add new images to your galleries or modify existing ones then Lightroom will mark them for publishing. When you publish them they'll be uploaded and the publish service will regenerate the rest of the site. If you're used to traditional Lightroom galleries where you have to wait needlessly for all the images to be uploaded then you're going to really notice a speedup in your workflow here. If you wish to update your site's design then you should edit the template in the web module. Don't forget to save your changes back to the template before publishing. The next time you publish an image the entire site will be updated to include your modification (but the images won't be uploaded again, obviously). You may also like to learn about creating private galleries.